We report on 13 patients diagnosed with meningococcal infections in patients attending state-owned hospitals serving an indigent population in Pretoria in 2009. The case fatality rate was 27%. Ceftriaxone was the main antibiotic (9 out of 13 patients) for therapy. Five isolates (39%) were serogroup B and 4 (31%) serogroup W135. Most isolates (12/13) were fully susceptible to penicillin (MIC range 0.016 - 0.047 µg/ml). A single isolate was intermediately resistant to penicillin (MIC, 0.125 µg/ml) while all isolates were uniformly susceptible to ceftriaxone, ciprofloxacin and rifampicin. This pattern reveals a shift in serogroups with an increase of serogroup B disease in the Pretoria region, and the need for ongoing monitoring of antimicrobial susceptibility profiles and the value of ceftriaxone for favourable therapeutic outcome. 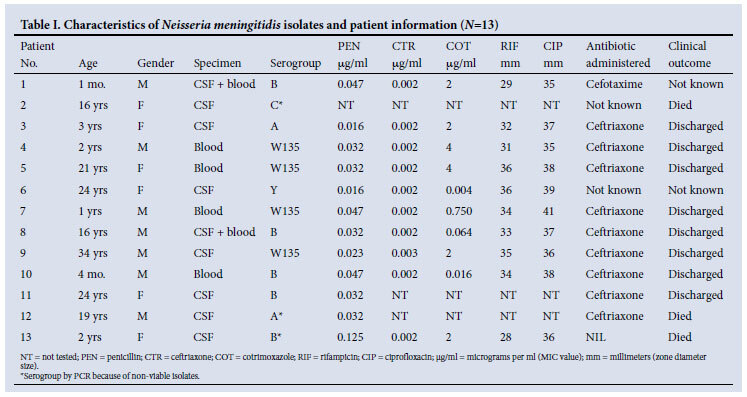 To the Editor: Neisseria meningitidis is an exclusive human pathogen causing serious disease worldwide resulting in rapid mortality, and is associated with large epidemics every 5 -10 years. It remains a leading cause of bacterial meningitis in children and young adults.1 Person-to-person spread of N. meningitidis can result in community epidemics of bacterial meningitis with major public health consequences.2 We analysed the laboratory records of N. meningitidis from blood and/or cerebrospinal fluid for the year 2009 and observed an increase in the number of serogroup B isolates from previous years.3 This has implications for vaccine use, as serogroup B is not included in the currently available quadrivalent vaccine. Table I provides patient data, serogroups, antimicrobial profile and clinical outcome; 7 were males; age range was from a 30-day-old infant to a 34-year-old adult; 5 (39%) isolates were serogroup B, and 4 (31%) were serogroup W135. Most (12/13) isolates were fully susceptible to penicillin (<0.06 mg/ ml); one was intermediately resistant (MIC, 0.125 mg/ml) belonging to serogroup B. All tested isolates were susceptible to ceftriaxone. None produced beta-lactamase. Seven (70%) isolates were resistant to cotrimoxazole with MIC values of 2 - 4 µg/ml. All isolates remained fully susceptible to rifampicin and ciprofloxacin by disc diffusion. The isolate that was intermediately resistant to penicillin was also resistant to cotrimoxazole (MIC, 2 µg/ml) but fully susceptible to rifampicin and ciprofloxacin. The case fatality rate was 27% (3/11) with known clinical outcome. Patient 2 isolate was from a post-mortem CSF specimen, patient 12 died 5 days post-admission and patient 13 died at the time of admission. Outcome was not known for patients 1 and 6 as hospital records were not traceable. Ceftriaxone was administered for 10 days for the patients who had a favourable outcome. In South Africa during 2006 - 2009, the predominant serogroup in all age groups was W135, with serogroup B the second most common.3 Serogroup B caused peaks in disease in the Western Cape in 1979 and 1988, and was also the predominant serogroup in Johannesburg during 1980 - 1982, with more than 60% of disease in children.5,6 Meningococcal disease is characterised by sporadic cases throughout the year with occasional small clusters and a definite seasonal increase in winter and early spring.6 In our study, serogroup B was the more common type, and only one isolate (MIC, 0.125 µg/ml) belonging to serogroup B had decreased susceptibility to penicillin. The recommended first-line drug of choice for proven meningococcal septicaemia is intravenous benzyl penicillin, with ceftriaxone or cefotaxime as empiric therapy for suspected bacterial meningitis.6 The emergence of drug-resistant meningococcus is increasingly worrisome.7 As ceftriaxone, ciprofloxacin and rifampicin are the recommended agents for chemoprophylaxis,6 they have remained fully susceptible as demonstrated in this study. Consequently, their continued use is supported as the main aim is to prevent secondary cases by eliminating nasopharyngeal carriage. Of the 13 patients, 6 were <5 years old; the remainder ranged from adolescents to young adults, in keeping with global trends.8 Vaccination in these age groups therefore is paramount to prevent severe disease and mortality. To conclude, we showed an increase of serogroup B disease in the Pretoria region; the need for ongoing monitoring of antimicrobial susceptibility; the value of ceftriaxone for favourable therapeutic outcome; and that the isolates were fully susceptible to the agents commonly used for chemotherapy viz. ceftriaxone, ciprofloxacin and rifampicin. Acknowledgement. We thank the National Institute for Communicable Diseases (a division of the National Health Laboratory Service (NHLS)) for providing advice and guidance. 3. Annual report 2006-2009. GERMS-SA surveillance report, South Africa. http://nicd.ac.za/?page=germs-sa&id=97 (accessed 3 May 2011).